What are the 5 Common Pool Care Mistakes? Avoiding these 5 pool care mistakes will guarantee a crystal clear pool all season long. The #1 mistake is not testing your pool water. Most pool owners own a bottle of test strips, but they can’t tell you what the strip tests for. Water balance and sanitation is the single most important part of maintaining a swimming pool…. yet, even some pool guys do not carry a test kit on their trucks. 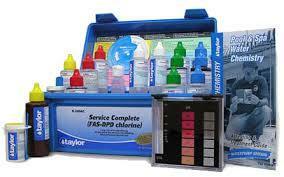 One that I highly recommend is the Taylor K-2006C FAS Test Kit. It’s very user friendly and easy to use. It even tells you how much chemicals to use based on your results. Learn how to test your water and keep a log of your test results. 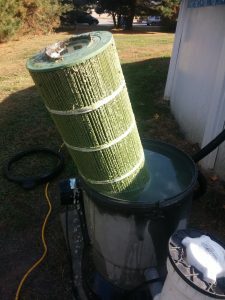 The 2nd most common mistake is not cleaning your filter. Cartridge filters require periodic cleaning and sand filters require weekly backwashing. Filtration is the most important part of maintaining a crystal clear, healthy, and safe pool. The 3rd most common mistake is not brushing your pool surface. Proper brushing in hard to reach areas such as behind ladders and in corners (where water might not be circulating well) eliminates the possibility of algae creeping up in your pool. The 4th, and maybe the most common pool mistake, is not addressing algae problems, both in and out of the pool. Take a look at your pool deck. Have you ever noticed any little green spots on the concrete and diving boards when they are wet? Mold, mildew, and algae spores grow all around the pool. Pressure washing the surfaces outside and around your pool will help prevent algae getting in to your pool. 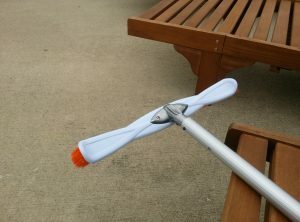 Check out this cool tool for pressure washing concrete decks. If your pool has an algae problem, choose the Algaecide chemical you are going to use wisely. Each type of Algaecide has a specific use. Uses include but are not limited to: black algae, for general prevention, mustard algae, pink slime, etc. Copper based Algaecide should only be used for a short time. Chlorine can begin to oxidize excess copper in the water and begin turning the water green. Seek the advice of a pool professional on which type to use. If you have dead algae on the surface of your pool, you will want to vacuum your pool to waste. Send all that junk out to your yard.. not through the sand filter. Cartridge filters do not have this ability, but with a little re-plumbing you can create a waste line between the pump and your cartridge filter. Last, we have the 5th common pool mistake which is not running your pump enough. Make sure you are running your pump and filter for no less than 8 hours a day. In the Midwest, I have always recommended running the system 24/7. 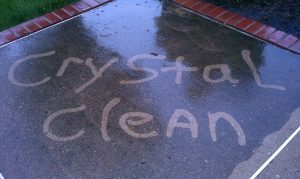 Stagnant water leads to all kinds of water issues: algae, pink slime, white water mold, etc. In closing, if you take ANYTHING from this article, take away the IMPORTANCE OF WATER TESTING. I cannot stress this enough. With the proper tools, you can do a complete water test like the professionals in less than five minutes. Don’t be intimidated by all the bottles in a Taylor Kit. You don’t have to be a chemist to use a Taylor Test Kit. You do need to test your water on a weekly basis as part of your regular pool maintenance routine. Your family and friends are depending on you. If you avoid these 5 common pool mistakes, you will be well on your way to enjoying a beautiful crystal clear pool all summer long. If you have questions please comment below..